Siemens today introduced two new World GSM phones - the stylish SL55 and the musical M55. SL55 delivers great features in a small package - it measures 3.2" x 1.75" x 0.86" and weighs only 2.8 ounces. 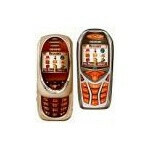 It supports GSM/GPRS Class 8, MMS and J2ME for downloadable applications and games. SL55 also sports a built-in email client and WAP 2.0 mini browser. Its keypad slides up to conserve space. Siemens will offer a camera with built-in flash as an add-on accessory. Other highlights include polyphonic ringtones, downloadable logos and wallpapers. Siemens SL55 will be available at stores in May 2003, with expected price tag of about $550. The lower-end M55 allows users to compose their own ringtones and share them with others, using the included Cubasis Steinberg software. It sports a 4096-clor display and can be used anywhere in the world where GSM is supported, including Americas, Europa and Asia. M55 has a sylish design and supports many accessories including a digital camera with built-in flash. It will hit the stores in June 2003 and is expected to cost around $450.